It’s still dark outside when I put my boat into the water. As I quietly use the trolling motor to put myself in the best position to start fishing the reeds, I look over into my tackle box. This tackle box has been with me for as long as I’ve been fishing—more than 20 years now—and I’ve had the opportunity to fill it with the fishing lures that I have found to be the best ones for whatever specific condition I’m fishing in. Some people think that a fishing lure is a fishing lure, and one is just as good as the next. Let me tell you, that’s simply not the case. If you’re fishing for crappie, for example, you will want to use a different kind of fishing lure than if you are fishing for smallmouth bass. 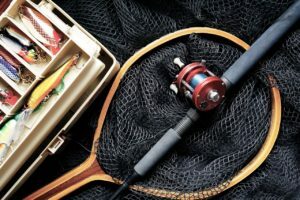 Or, if you’re fishing in heavy brush, the types of food that the fish are looking for will be different than what they may be looking for on the bottom out in the middle of your lake. You need the right fishing lure for each situation, or you may as well be rolling the dice on your success. Me, I’m not the kind of guy who likes to gamble. If you don’t have the right lure for the situation, you may as well just stick a worm on a hook and hope for the best. It’s just about the same thing. I have spent years building up the best collection of fishing lures and now, no matter where I am, or what type of fish I’m looking for, I just spend a few minutes looking through my tackle box, select the appropriate lure, and go to work. Later this evening, after the day’s catch has been cleaned, filleted, and roasted over an open fire, I’ll spend some time going through my fishing lures and organizing them for tomorrow. I’ll check each lure to be sure it’s in good repair, and make sure that I take note of any that need to be replaced. Believe me, you don’t want to wait until you’re on the water to find out that the lure you need is no longer working properly and needs to be replaced. Browse through our fishing lures today, and start building your collection. This entry was posted in Product Blog and tagged fishing equipment, fishing lure, fishing lures, going fishing.